In a rare interview that took place in 2012, Bill MacKay said an interesting thing about the relationship between his skills as a multi-linguist (he's studied French, Spanish and Portuguese) and his output as a composer and guitarist in his uniquely exploratory folk-blues vein. The Chicagoan said: "I have been amazed to see that in the heat of speaking with someone, it is very often that you’ll use words you never learned – and correctly. The inherent logic of a language works with the mind in an intuitive way – uniting known and unknown. It can be sort of like finding your way around the house in the dark." To listen to Esker is to find your way around the house in the dark, when memory and feel suggest that familiar ground is being covered yet there remains a bewildering mystery to your navigation and the vague foreboding, or in Esker's case anticipation, that the intended trajectory contains unexpected complications. 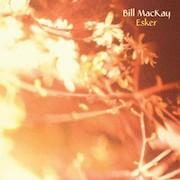 The album, made up entirely of instrumentals, is recognisable through structures and motifs that reflect MacKay's experience in jazz improvisation; a brand of folk-blues that falls somewhere in the midst of Davey Graham and John Fahey; and even psych-folk along the lines of Comus or Trees. Yet despite these touchstones, there is a shadowy enigma within Esker that verges on the blissful, thanks to its peculiar melodic turns and idiosyncratic use of sonic effects. One of MacKay's most recent prior releases was an album of guitar duets with the younger, much-heralded so-called virtuoso Ryley Walker, Land of Plenty. Whereas that album sprawled and meandered – often heroically – Esker is tight and unadorned at just 33 minutes long. Indeed, the opening track, 'Aster', with its play between MacKay's slide work on electric guitar and a rickety piano part, really explores just one idea. No tracks go much beyond the skeletal, though there is a warm and engaging hook in every one, and more importantly, each is generally stylistically distinct to the others. Take 'Candy', for example, a fine display of MacKay's fretboard dexterity. In its ragtime-influenced bounce, it might play over the opening credits of a Woody Allen film or an episode of Louie – it is also in the direct lineage of long-forgotten, recently unearthed 1970s guitarist John Hulburt, an album of whose songs MacKay released in 2015. That's about as 'jazzy' as it gets, with the most intriguing pieces being those that employ pronounced guitar effects, such as 'Persona', arguably the album's best track, where sharp staccato plucks overlay sustained howls of noise. It is the most alluring exploration of rhythm on the record, while something of this mood and sound returns later on 'Wail', a fragment of transportive pastoral calm defined by its lightly delivered bird-like chirrups of electric guitar. Elsewhere, something more abrasive emerges with 'Powder Mill Park', which is very much in the spirit of the cascading folk-rock of Steve Gunn's Eyes On The Lines and Way Out Weather. Also refreshing about Esker is the fact that it makes no pretences to 'Eastern' influences – no Middle Eastern scales, raga-based passages or even much in the way of drone tunings here. This is relatively rare among the psychedelic-minded folk guitar set; as much as figures like Gunn, Sir Richard Bishop and myriad others employ it to dazzling effect, embracing such modes can, however, seem heavy-handed, gimmicky and pretentious in the hands of less imaginative or aware artists. It is almost novel of MacKay to opt against dropping in a few Eastern-isms here. Certainly, Indian music has inspired him before – the album with Walker being a case in point – but Esker is a lean, taut affair with highly distinguishable melodies that are firmly Western in one way or another. Not that MacKay should be thought of as conventional or undemanding. His move with 'The Hollows' proves him playful and willing to embrace the jarring and the fragmented; this extremely lovely tune doesn't even reach one minute before it is abruptly halted mid-flow. It's that sort of thing that is a bit like stubbing your toe on a table-leg in the dark (not that curtailing the track in this way is anything but worthy of respect). Just as well MacKay also possesses such a graceful sense of harmonic and melodic control and balance – essential tools for negotiating the abyss.